Many people find it challenging to come up with patio design ideas. This is due to the fact that there are so many elements to consider! I like to come up with patio ideas that are both creative, unique and functional. Creative paving patterns and special design elements will make your design very special. Here are some common questions and how I address them. 1. How large should a backyard patio be so that a dining table and comfortable patio chairs or lounges will fit nicely? Typically, fifteen feet or more is needed for a 60" table and chairs. Ten feet should be allowed for lounges. In addition, there should be space for access throughout the patio. Size is often based on what you will be using your patio for. Is it just a cozy spot for a small family or will there be a lot of entertaining? Consider how you live and entertain to help determine the size of your deck and patio designs. 2. What shape should outdoor patio designs be? The sky is the limit here. Curvilinear patios give a more natural look, while geometric ones tend to look a bit more formal. Sometimes we can create a combination of both for very unique patio designs. 3. What paving material would be best? There are many paving materials to choose from. 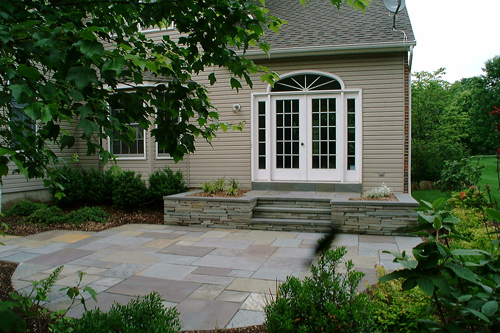 Patio materials should integrate with your surroundings and work with your budget. 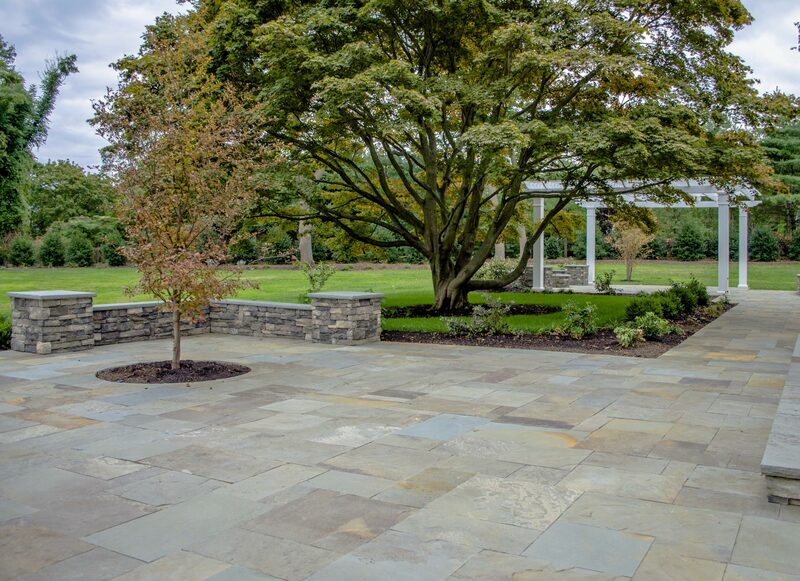 Some patio materials to consider are concrete (we prefer colored concrete), stamped concrete, paver patio designs, landscaping brick, flagstone, bluestone, travertine pavers, and other types of natural stones. Take a look at the patio pictures here and on our Projects Page for ideas. 4. What will a patio cost? This will depend on the size and which paving material is chosen. Steps or side walls (if your patio is to be raised) will have an impact also. 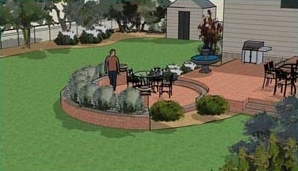 Once the design is created, estimates can be attained with various paving materials so you can see the differences. There are other patio design ideas that can make your patio stand out from the usual ones you see in New Jersey. Such features such as seat walls or artistic paving designs are a few. Seat walls are great for some extra seating, and they are attractive pieces of architecture. 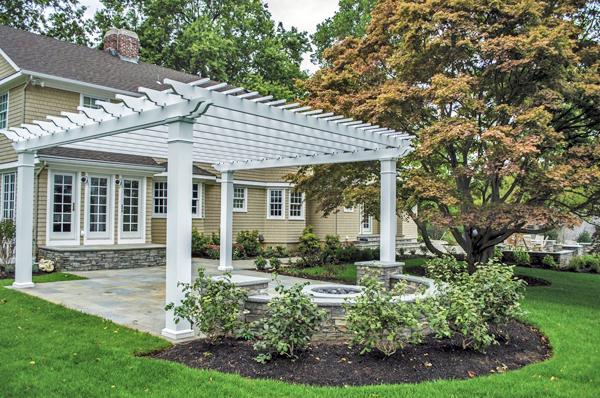 For shade, you can consider an outdoor pergola or even just some very large shade trees. Other examples of design elements of landscape patio designs that can be included are outdoor kitchens, outdoor fire pits, fireplaces and water features. Stay tuned until the end to see it all come together! 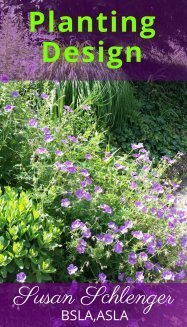 Which Paving Material Should I Use?